Whether part of a child’s Halloween haul or the contents of a heart-shaped box, chocolate is synonymous with pleasure. But behind the sweet image is a dark history of exploitation. Bitter Chocolate traces the fascinating origins and evolution of chocolate from the banquet table of Montezuma’s Aztec court in the early sixteenth century to the bustling factories of Hershey, Cadbury, and Mars today, revealing that slavery and injustice have always been key ingredients. The heart of the book takes place in West Africa inside the Ivory Coast—the world’s leading producer of cocoa beans—where, as Off discovers, profits from the multibillion-dollar chocolate industry fuel bloody civil war and widespread corruption. Faced with pressure from a crushing “cocoa cartel” demanding more beans for less money, poor farmers have turned to the cheapest labor pool possible: thousands of indentured children who pick the beans but have never themselves known the taste of chocolate. 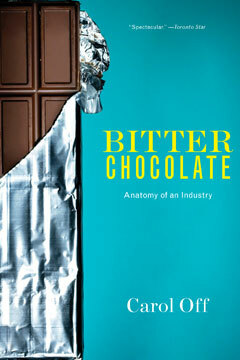 Bitter Chocolate is an absorbing social history, a passionate investigative account, and a shocking exposé of an industry that has institutionalized misery as it indulges our whims.